Hart gets a one-year deal with the Mariners worth a guaranteed $6-million with incentives that could push the deal to $13-million. That’s twice as much as the deal offered by the Milwaukee Brewers, which the Milwaukee Journal Sentinel reported to be $4-million with another $2.5-million in incentives. Hart missed the entire 2013 season after knee surgery on both knees. He made $10-million last season. 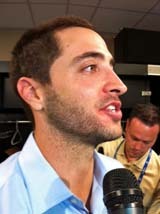 Hart’s departure leaves the Brewers with a void at first base. It this time, James Loney appears to be the top free agent after playing for Tampa Bay last season. But Loney may be too expensive for the Brewers. A trade is another option, but GM Doug Melvin may be reluctant to part with some of the Brewers young pitching. But Melvin said he would explore both options. Coming off of double knee surgery, it’s a good opportunity for Hart to not have to play defense everyday, instead being able to take advantage of the designated hitter in the American League. In eight-plus seasons with the Brewers, Hart hit .276 with 154 home runs and 508 rbi’s in 945 games. He was a National League all-star twice (2008 & 2010). Longtime baseball managerial greats Bobby Cox, Tony La Russa and Joe Torre were unanimously selected for election to the baseball Hall of Fame by the Expansion Era Committee. Former Brewers catcher Ted Simmons was on the ballot, but didn’t come close to the 12 votes needed for election. Cox ranks fourth all-time in wins among managers, compiling a 2,504-2,001 (.556) record in 29 seasons as a Major-League manager. LaRussa ranks third all-time in wins among managers, compiling a 2,728-2,365 (.536) record in 33 seasons, winning the World Series with the A’s in 1989 and the Cardinals in 2006 and 2011. Torre won four World Series titles and six pennants in 29 seasons as manager, following 18-years as a player. As a manager, he went 2,326-1,997 (.538). Baseball’s winter meetings are underway in Lake Buena Vista, Florida today. 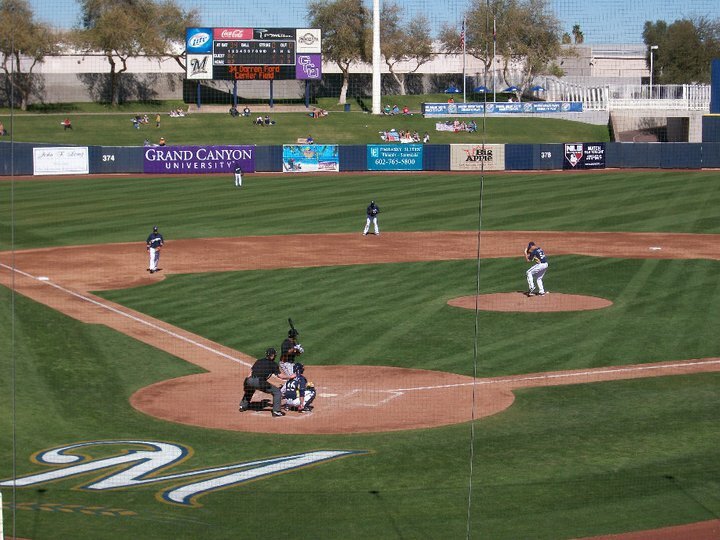 The Brewers are looking for a first baseman and would prefer to resign Corey Hart. clearance to return to full baseball activities. Hart had surgery on both knees and missed the entire 2013 season. 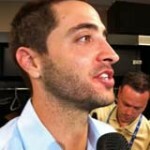 He has drawn interest from a handful of teams, including the Brewers. The Brewers still don’t have a first baseman and they’re waiting to see Hart go through some baseball drills to determine their interest in him moving forward. four teams who have shown interest in signing him but also said nothing would happen until he gets medical clearance to play on December 3. Hart told Sirius XM, the Brewers, Tampa Bay, Boston and Colorado have contacted his agent but are awaiting a clean bill of health before considering formal offers. Hart missed the entire 2013 season after undergoing surgery on both knees and the Brewers never did find a suitable replacement at first base. brought some optimism towards a post-season run. 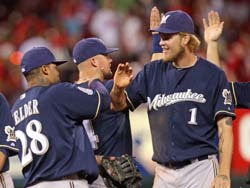 Prior to Lohse signing with Milwaukee, they thought winning games would have to come from the offense. They’ll still need to score runs, but the added pitching adds promise. Lohse had pitched for four teams over 12 Major League seasons, but his best seasons have come in St. Louis the last two years, including a 16-3 mark in 2012 with a 2.86 ERA. when he was stung by a small scorpion, which sent him to the hospital for a few hours. Melvin was stung on the middle finger of his left hand and soon after began experiencing symptoms. intrasquad game today, then Mike Fiers will start the teams exhibition opener tomorrow against the Oakland A’s. Unlike springs past, many of the team’s top players are expected to get considerable playing time right out of the gate as they prepare for the upcoming World Baseball Classic. Training until Friday and he’s already sent notice to the team’s media relations department that he will not field questions pertaining to Yahoo Sports’ report linking him to a Miami Clinic that is alleged to have sold PED’s to several baseball players. Braun said his lawyers had contacted the clinic while doing research to aid in his successful appeal of a 2011 positive test. 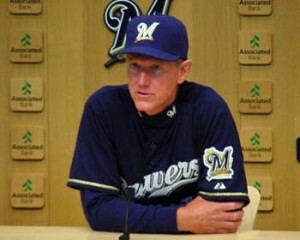 Manager Ron Roenicke said he’s taking a wait and see approach. First baseman Corey hart said he’s ahead of schedule following knee surgery and he’s pushing for a return to action by the end of April instead of mid to late May. Hart said the swelling is already gone in his surgically repaired knee and doctors say he’s ahead of schedule. opting instead for a second opinion. An MRI performed on Hart’s right knee was being sent to a specialist to see if he agrees with the diagnosis of Brewers team physician William Raasch.